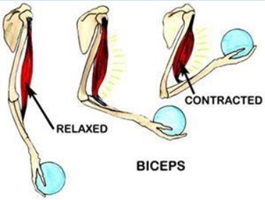 The Biceps muscle is a strong muscle in the front of the arm that contracts to bend the elbow. The biceps works mostly at the elbow to cause flexion of the elbow, which occurs when you do a curl as in weighlifting or when you lift anything upward toward your face. The biceps muscle is unique because it attaches to the radius bone across the elbow and also attaches through two heads to the humerus and the scapula. Thus, it crosses both the shoulder and the elbow. With biceps tendonitis, you may feel pain in the front of the shoulder. Pressure in the area of the biceps will cause pain. 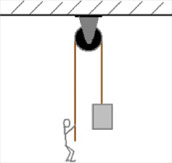 Use of the arm overhead may also be associated with pain in the front of the shoulder. 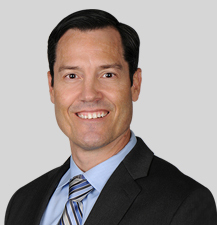 Biceps problems are usually either the result of a repetitive motion associated with overhead work or a sudden injury with or without a rupture of the adjacent subscapularis tendon. 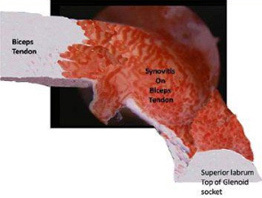 When the injury is a consequence of chronic inflammation, it is called biceps tendonitis. 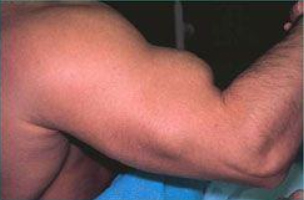 The normal biceps tendon is smooth and white. 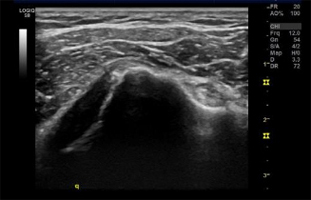 Synovitis is shown on this arthroscopic view with the magnified inflammation appearing as many small vessels over the tendon. This may be the appearance of biceps tendonitis. 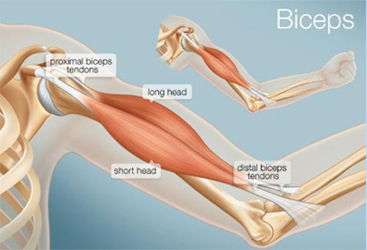 In some patients, the tendon may suddenly rupture causing pain and a noticeable bulge of the biceps muscle, since the tendon retracts (pulls back) and the muscle shortens and becomes wider. This has been called a “Popeye sign” after the cartoon character who had biceps muscles with this shape. 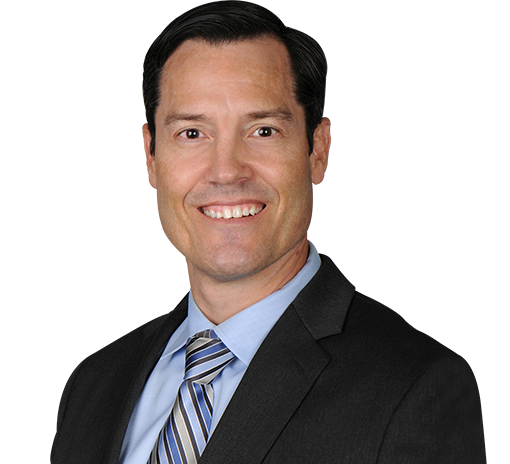 In most patients, there is no need to fix the tendon rupture because the patient may notice that the pain he/she had eventually resolves. 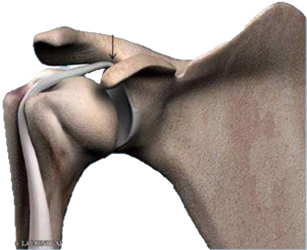 This is due to the fact that the degenerated tendon is no longer sliding up and down in the front of the shoulder. Occasionally a patient may have pain and cramping or may not like the cosmetic deformity. In such cases a biceps tendon tenodesis is performed (described above). 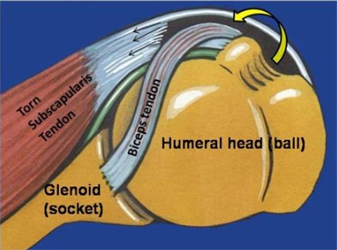 In cases where the subscapularis tendon ruptures as the result of an injury, the biceps tendon may subluxate (pop out of) the groove in which it normally runs in the front of the shoulder. Physical therapy and activity modification may help to relieve pain. 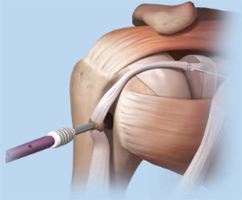 Ultrasound guided injection allows for precise injection of a corticosteroid to help relieve the inflammation. Avoidance of repetitive reaching and lifting may allow the tendon inflammation to improve. Antiinflamatory medications may help reduce pain.